(2 Customer Reviews) | Write Review 12 issues per year Craft Stamper is the UK’s best and brightest specialised stamping magazine! Each month, we bring our readers an eclectic mix of inspirational stamping projects, ranging from cute cards, to altered art, mini books, scrapbooking, mixed media and much more besides. 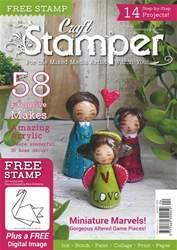 Every issue features step-by-step techniques to help our readers get the most from their stamping supplies and encourage them to develop their skills further. Unlike many other magazines, we don’t just feature quick and easy makes: many of our projects are challenging, encouraging our readers to stretch themselves creatively. Other regular features include designer challenges, masterclasses, and our new products pages ‘First Impressions’. We have a large pool of designers, helping us to keep the magazine looking fresh and vibrant each and every month and aim to bring our readers the latest products, trends and ideas. 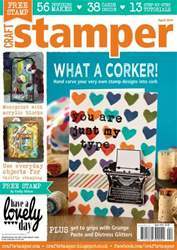 Craft Stamper is simply essential reading for the more adventurous crafter! Please note: The digital version does not include the Free stamp received with the printed version. Looking for Craft Stamper in print? Unfortunately pocketmags.com does not sell print copies of Craft Stamper, but all is not lost. Our partner at magazine.co.uk sells print subscriptions at the best prices online. Hello! Some of our readers have been asking us for more projects that use items they already have in their stash. Well, we aim to please, so our focus this month is on repurposing readily available supplies in order to get a bit more mileage from them. We start on p.6, where Trish shows you how to recreate the trend for monoprinting using an ordinary acrylic block. Anna-Karin creates a stunning resist effect using a crayon and embossing folders (p.10), Emy makes awesome DIY stamps from bottle corks (p.34) and Jaine makes creative use of some fabric scraps (p.76). If you had some new goodies for Christmas, then we may be able to help you out there too! Explore techniques with Gelatos (p.80), Grunge Paste (p.69) and Distress Glitters (p.46). Finally, we have two more new Design Team members joining us this month - please welcome the fabulously talented Jenny Marples and Jane France. I am sure you’ll extend them a warm hello. Happy stamping! 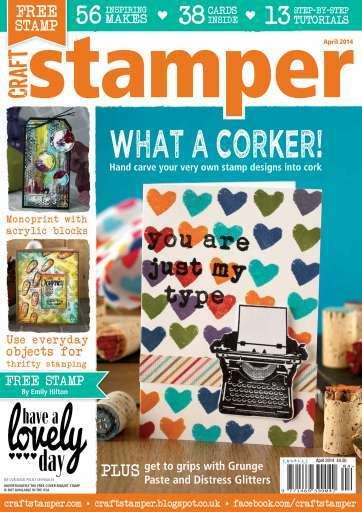 Craft Stamper is the UK’s best and brightest specialised stamping magazine! Each month, we bring our readers an eclectic mix of inspirational stamping projects, ranging from cute cards, to altered art, mini books, scrapbooking, mixed media and much more besides. 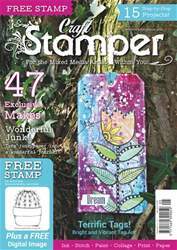 You'll receive 12 issues during a 1 year Craft Stamper magazine subscription. I recently started reading this magazine, I usually buy the paper magazine. But the content is awesome, specially for mixed media projects. I love the techniques they feature.. This is a really great digital magazine. Very user friendly especially when viewed on iPad. 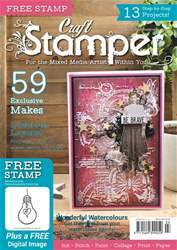 You'll receive 12 issues during a 1 year Craft Stamper magazine print subscription.